Most healthy short-haired cats can maintain their coats on their own. An occasional brushing by their owners will remove loose hair and add gloss to their coats. A quick nail trim and a peek in the ears are about all that’s needed. Persian cats are another story. Making a Persian part of your family has wonderful rewards: companionship, comfort and laughter. Their exotic beauty goes without saying. This unique breed, however, requires special owners – ones willing to commit to the daily task of grooming. Some Persians are fastidious about keeping clean; others require help. Because eye tearing is common, you’ll need to check your pet daily, wiping their eyes clean with a gauze pad and sterile saline. Be sure to use a separate pad for each eye to prevent the spread of infection. Daily attention to the fur on your Persian’s cheeks will keep staining in check. A commercial tear-stain product will make the task easier. We use the Anna products for eye care and to prevent staining, their website has a great “how to” video showing how to use these products. Although many products are advertised as stain removers, it has been our experience that once the white fur on our silver Persian cat’s cheeks stain, it’s nearly impossible to get the staining out. Prevention has been our approach by cleaning as needed and using the powder to prevent stains from forming. Most kitties require little maintenance for their ears, but some produce excessive ear wax. This can be removed with a cotton ball and ear-cleaning solution. Gently fold the ear open and sweep the cotton ball in the contours of the ear, scooping outward. The inner ears should be free of wax, debris, redness or odor – which may indicate infection or ear mites. Cats’ claws grow rapidly and require maintenance. Most cats self-groom, and you’ll often see them pulling on their toes to remove the outer sheath of the claw. They are naturally prone to scratching textured surfaces as part of their nail care, so be sure to provide a scratching post. Trim nails every two weeks with claw trimmers or human nail clippers. Simply secure your cat on your lap, facing outward. Gently press each toe until the retractable claw appears. Trim below the curve of the claw (toward the pointy end) and beyond the pink “quick,” which is vascular and has nerve endings. Just like humans, cats need regular dental care. A high-quality diet and good oral care will help prevent tarter buildup, gum inflammation and tooth loss. Use flavored cat paste and a baby brush or brushing device designed for the index finger. Separate the gums and brush the outside of the teeth, where plaque accumulates. An occasional dental cleaning by a veterinarian may be needed. While short-haired cats rarely need a bath, Persians may need monthly baths to maintain their gorgeous coats. Human shampoos are too harsh, so be sure to buy a gentle soap and coat conditioner formulated for this special breed. Before starting the bath, gather two big towels, a hairdryer, cotton balls and your cat’s combs. A deep sink works best. Place a bathmat at the bottom to minimize slippage. A sprayer nozzle is helpful for rinsing. Use lukewarm water and wet your cat gradually. Scoop water up under its chin and along the legs and tail. Then, thoroughly wet the coat, avoiding the ears and eyes. Apply the soap and gently work it through the fur. Be sure to suds the haunches, groin and under the legs. Rinse well. A rinse-out or leave-in coat conditioner can be used at this point. Next, wrap your kitty in the towel to soak up excess water. Move to a dry area and place your cat on a new towel. Use a hair dryer set on a low, cool-to-warm setting for additional drying. Gradually, work a wide-toothed comb through the fur. A fine-toothed comb is good for the face and bottoms of the feet. Work efficiently because your cat’s patience is limited. Give a break if needed and go back later to finish fluffing the coat. Remember, each cat is unique. Some love grooming, while others barely tolerate it. Regardless, comb your Persian daily to prevent matting. Adjust techniques, products and tools for each individual coat to maximize your Persian’s beauty. Don’t hesitate to consult a professional groomer about how to use a grooming glove, differently sized combs, a slicker brush and a polishing cloth. Questions or Comments? Contact us using our form! 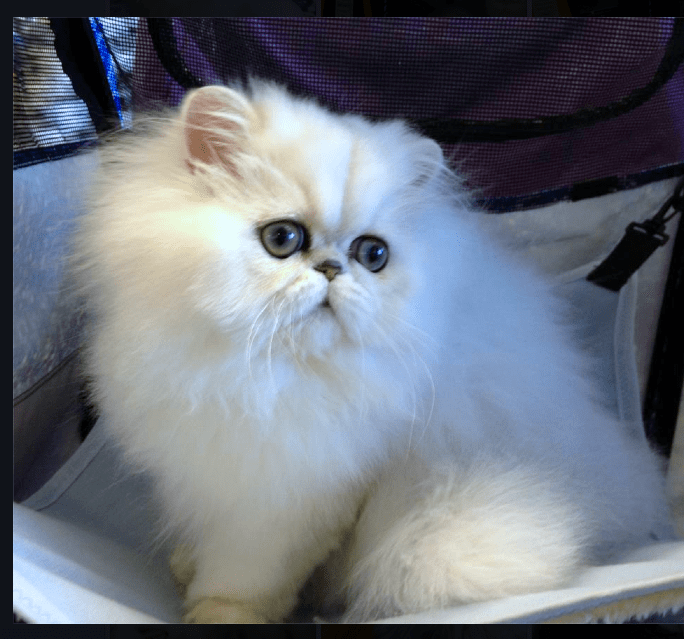 What is a Silver Persian Cat?